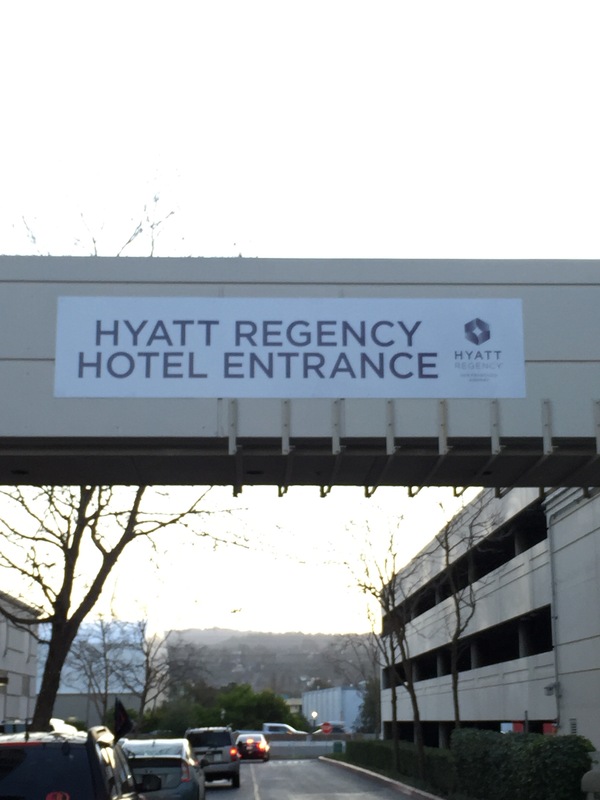 I booked the Hyatt Regency San Francisco Airport hotel via the Hyatt webpage and got a rate of around $110 per-night. I took BART to the airport and then waited for the hotel shuttle to take me to the hotel. The international terminal was closest to BART so I proceeded there and waited for about 15 minutes before the shuttle arrived. 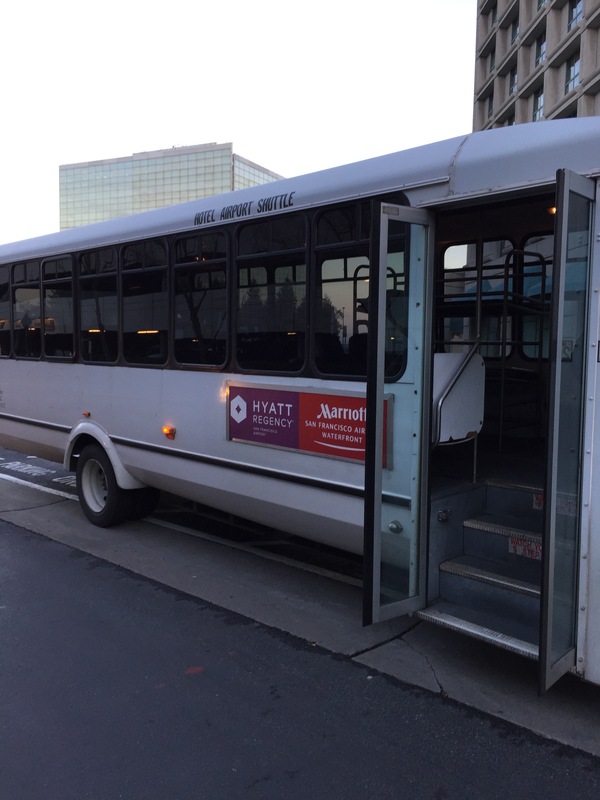 The shuttle serves the Marriott as well as the Hyatt. The driver greeted me and welcomed me. The driver asked what hotel I was going to and he thanked me and invited me to take a seat. The shuttle ride took about 15 minutes. 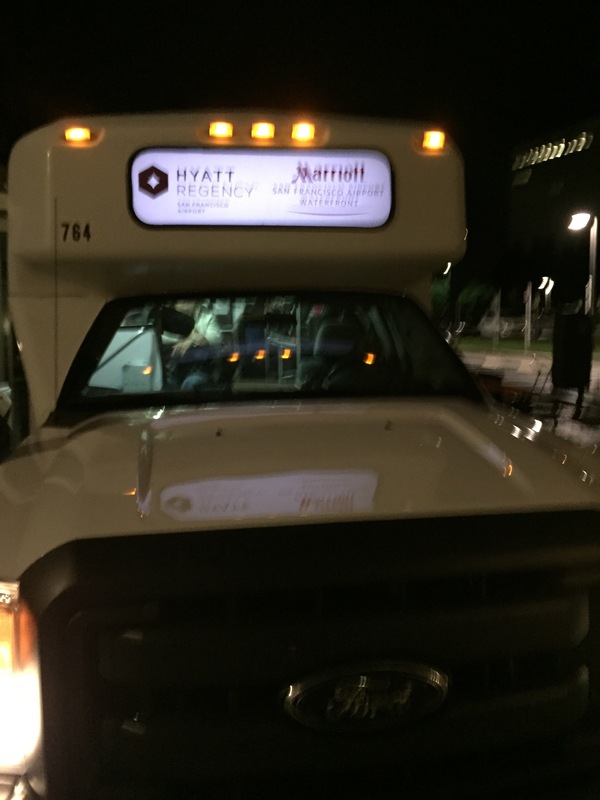 The bus first stopped at the Marriott before proceeding to the Hyatt. 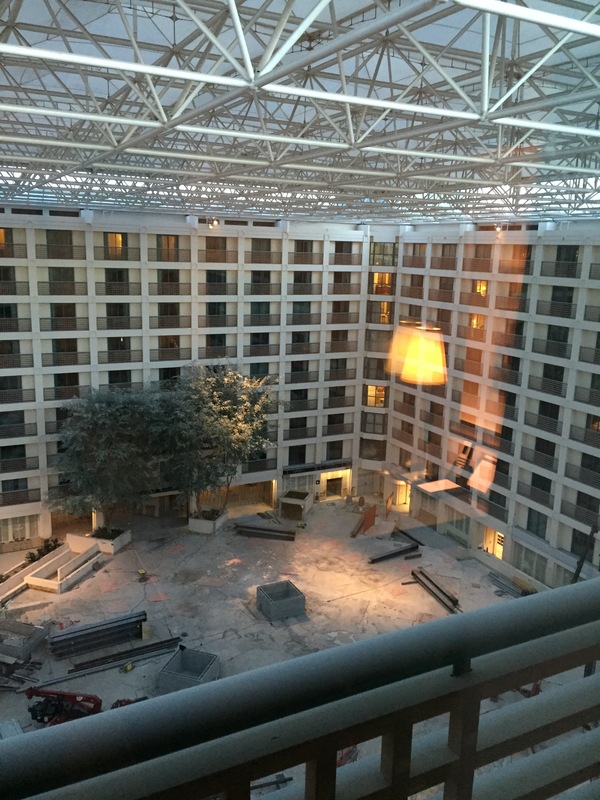 Upon arrival at the Hyatt I realized that the hotel was under construction as the bus pulled up to a temporary entrance to the hotel. 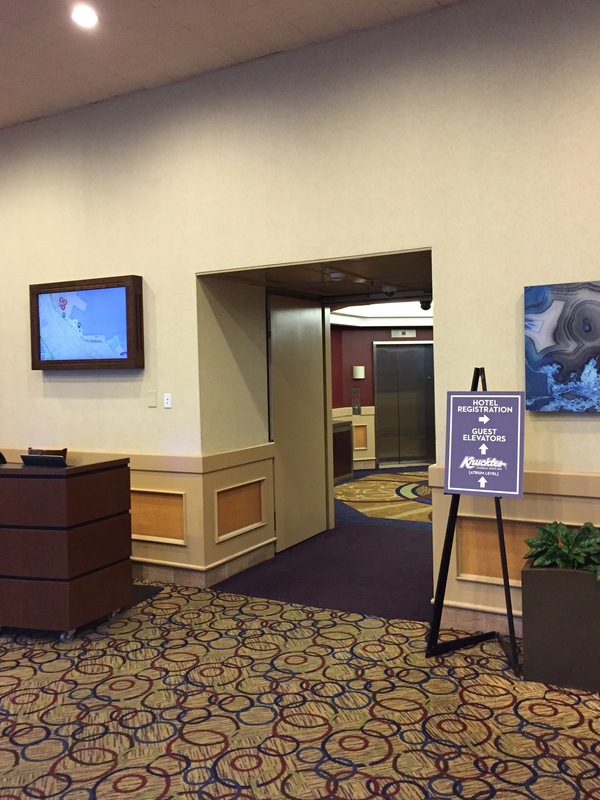 Once I entered the doors there were signs leading the way to the reception desk as well as signs promoting the renovations that were going on and how the hotel would look when they were finished. 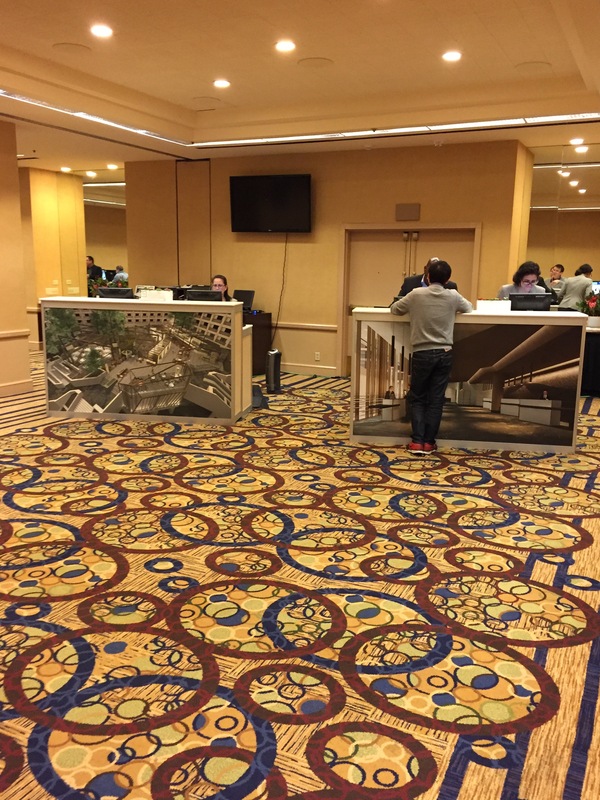 I located the registration desk after following the signs. 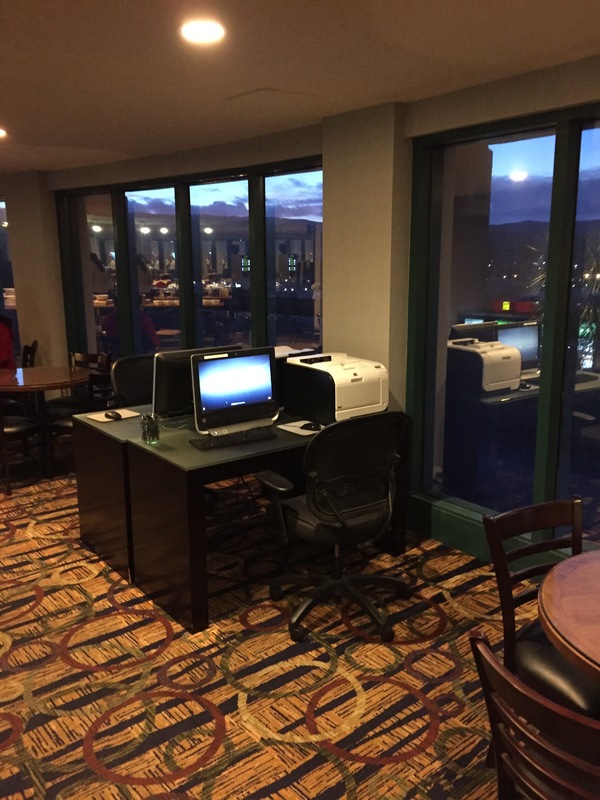 The room was a temporary setup and it featured a room with three desks and a small amenity area. 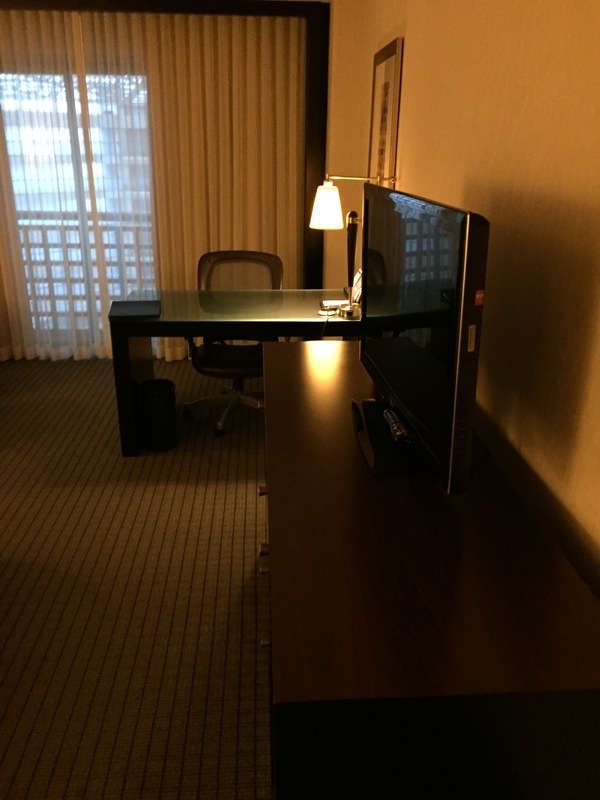 As I entered the room a hotel colleague smiled, made eye contact with me and invited me to a desk. The colleague offered assistance. After I accepted, she thanked me and she asked for my name. I provided it and I requested to check in. The colleague verified my identity and processed the payment. The agent thanked me for my Platinum status and welcomed me to the hotel. I asked if she could refresh the account as I was currently a Diamond Member. She did and saw that the status was in fact Diamond. The colleague thanked me for my loyalty and she informed me that she would upgrade my room the the club level and would provide access to the Regency Club. The colleague offered a late check out and asked what amenity I would prefer. I requested the points and she said I would get 1,000 bonus points The colleague used my name and thanked me and she asked how many keys I needed. I said one and she provided it and she informed me where to go to get to the room. The colleague welcomed me to the hotel and she offered additional assistance. After I declined she thanked me and wished me an enjoyable stay. I used the elevator to go to the 9th floor. 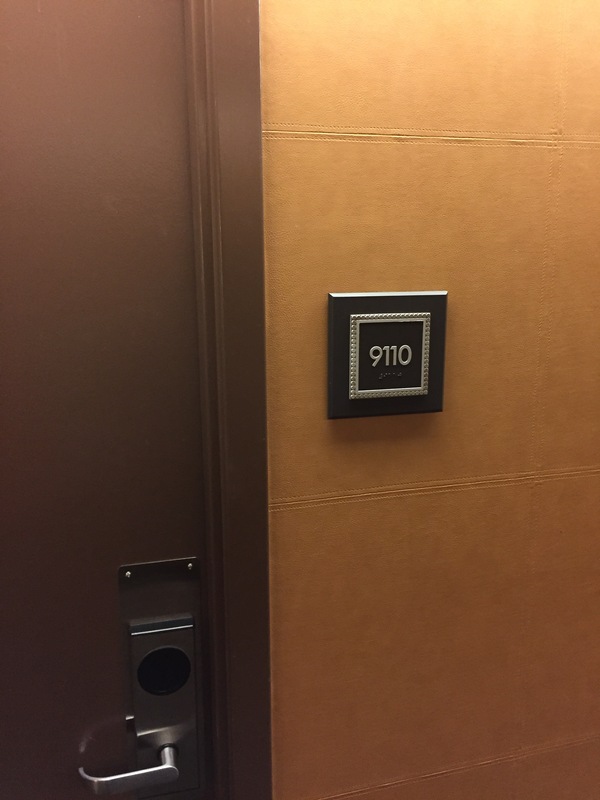 I was assigned room 9110 which was a standard king size bed club floor room. I used the key card to open the door to the room. The key functioned without issue. 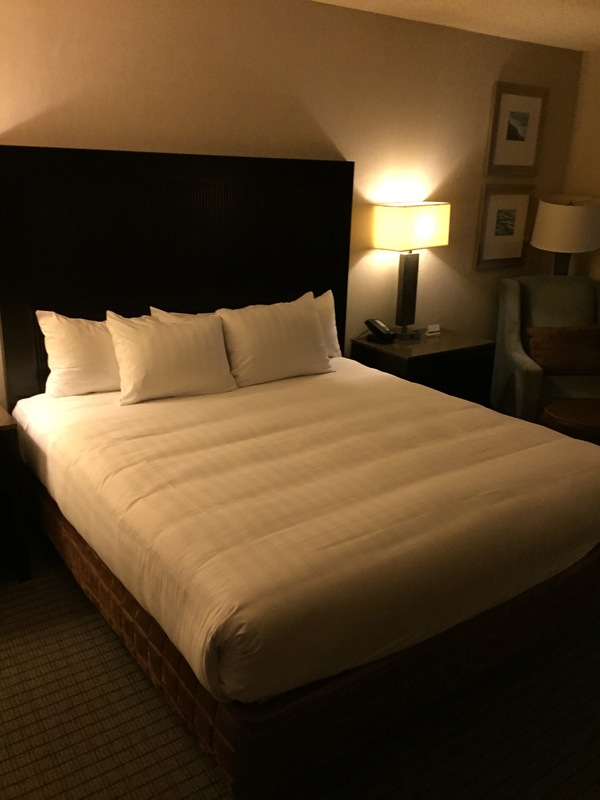 The room featured a king size bed with two bedside tables. 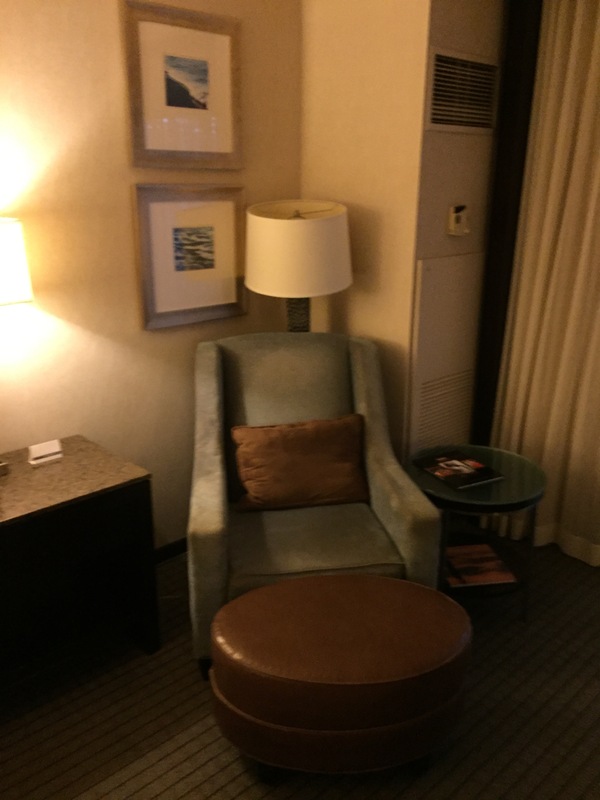 There was also a chair with footrest, a desk suitable for working on a computer as well as an office chair. At the foot of the bed there was a dresser and a TV on top. 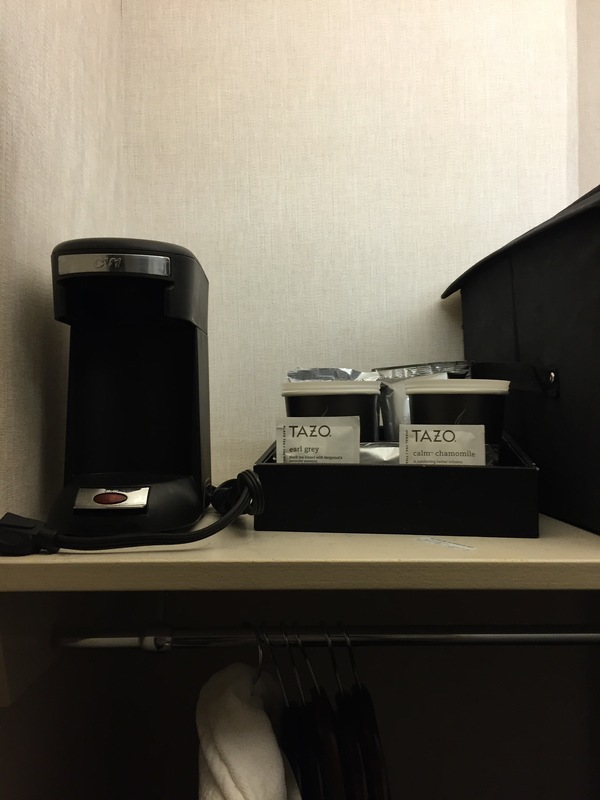 In the closest I found the coffee maker. I thought that was somewhat of an odd place to store it. 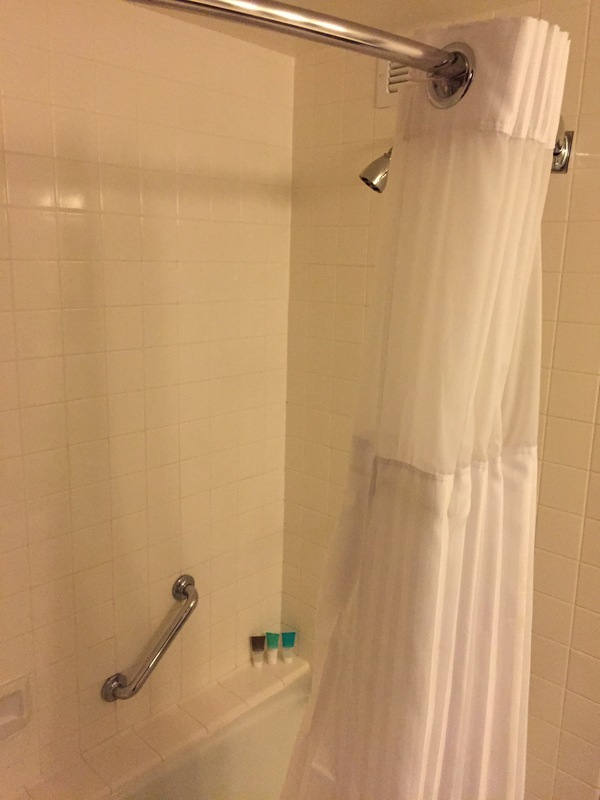 The bathroom featured a shower and bath tub combo. 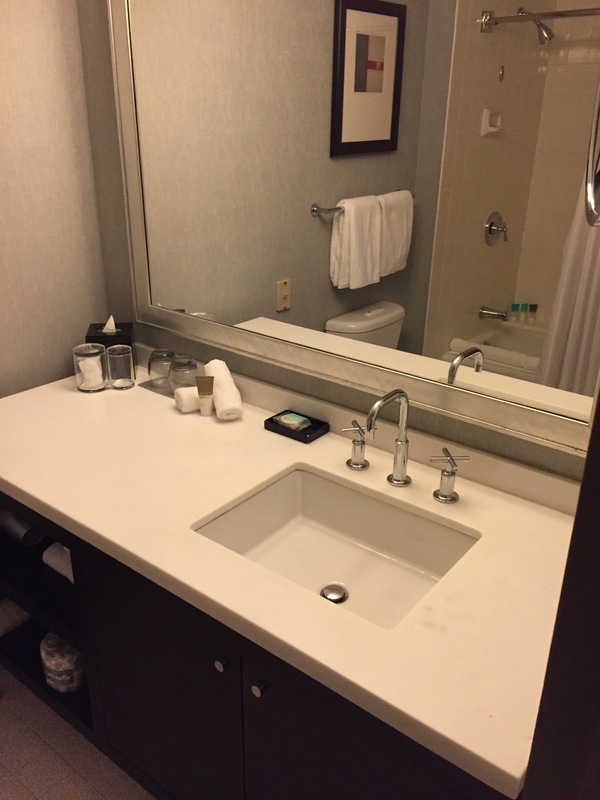 The vanity area was arranged neatly with the bath amenities. The linens were soft and clean and they had a pleasant scent. The room featured a balcony that overlooked the inside of the hotel. The view was of the renovation area so it was not much to look at. The bed was soft and comfortable and the room was quiet. The HVAC controls functioned and they were quiet. The water temperature and pressure was good. 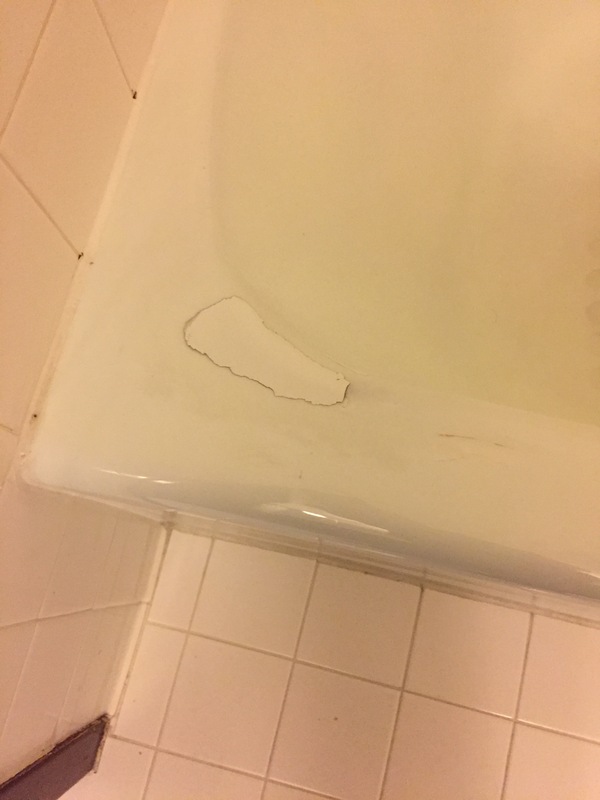 There was a crack in the tiles in the bath tub. No other defects were noted in the room. I attended the evening Regency Club reception. 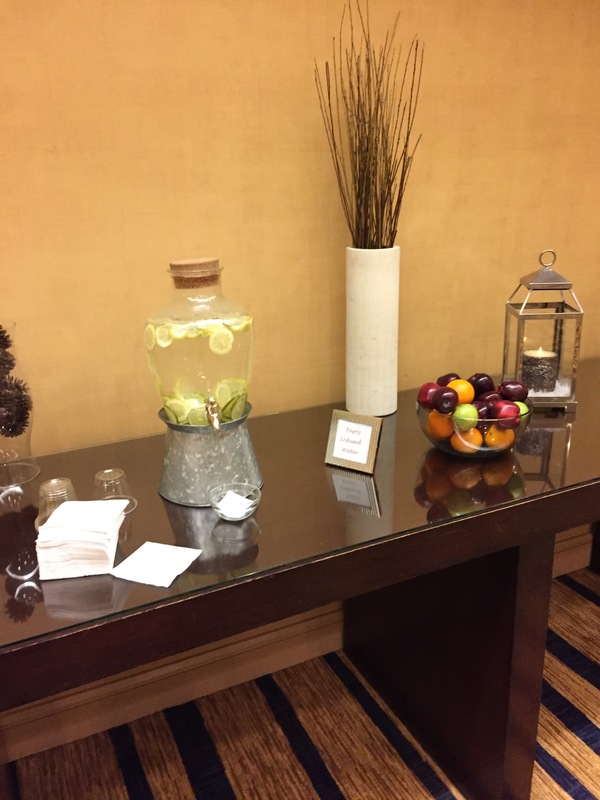 The lounge offers breakfast in the morning from 6:30 AM to 9:30 AM on weekdays. 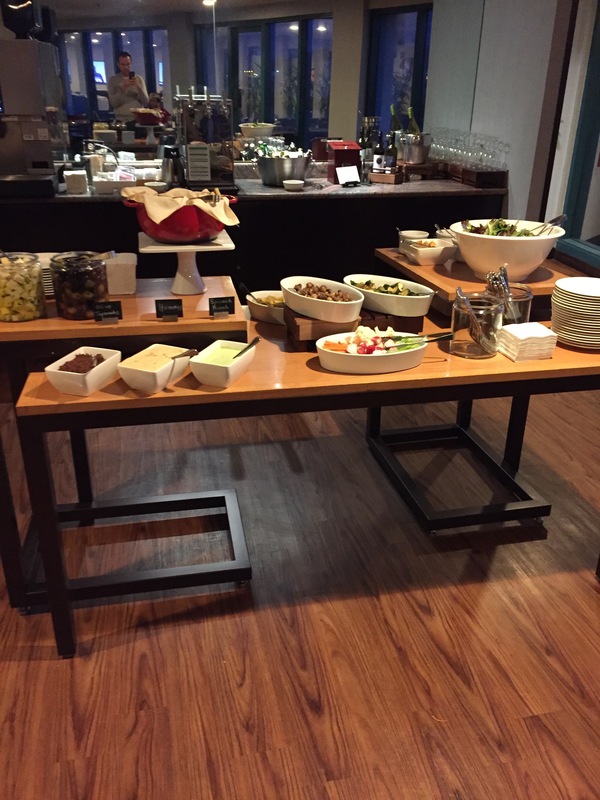 They offer light snacks between 11:00 AM and 4:00 PM and then evening meals from 5:00 PM to 8:00 PM followed by dessert from 8:00 PM to 9:00 PM. 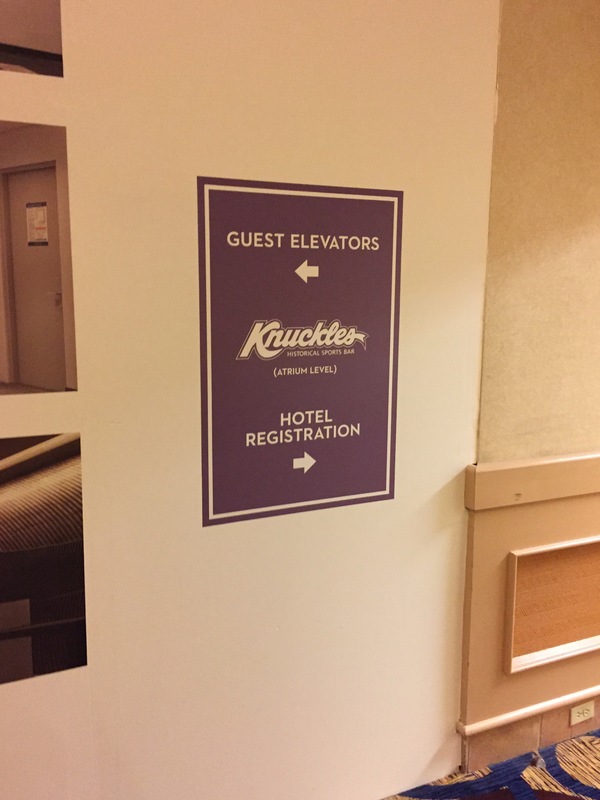 The lounge was located on the 9th floor. I used my key card to access the room. 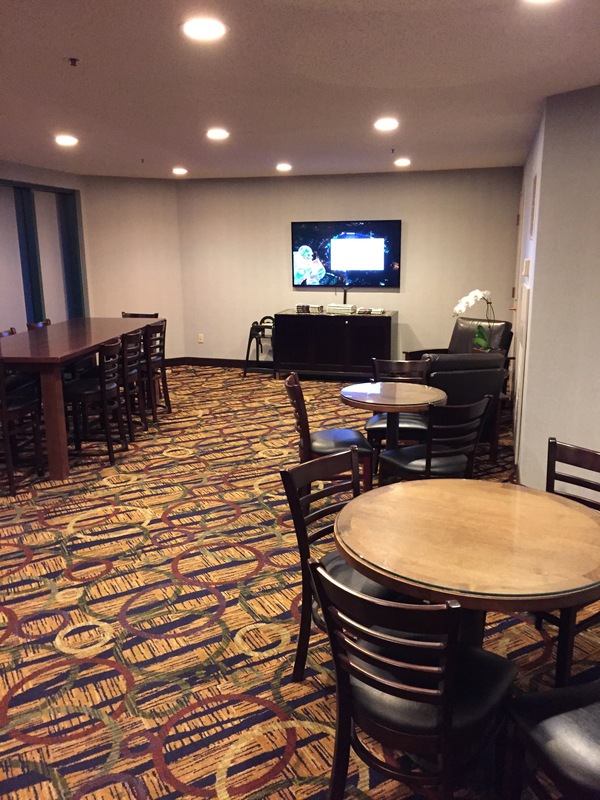 When I entered a found a small lounge area with a few tables and chairs on one side of the room as well as a television that was tuned to football. On the other side of the room was a large buffet area as well as a couple other tables and chairs. The lounge was not initially staffed when I arrived. 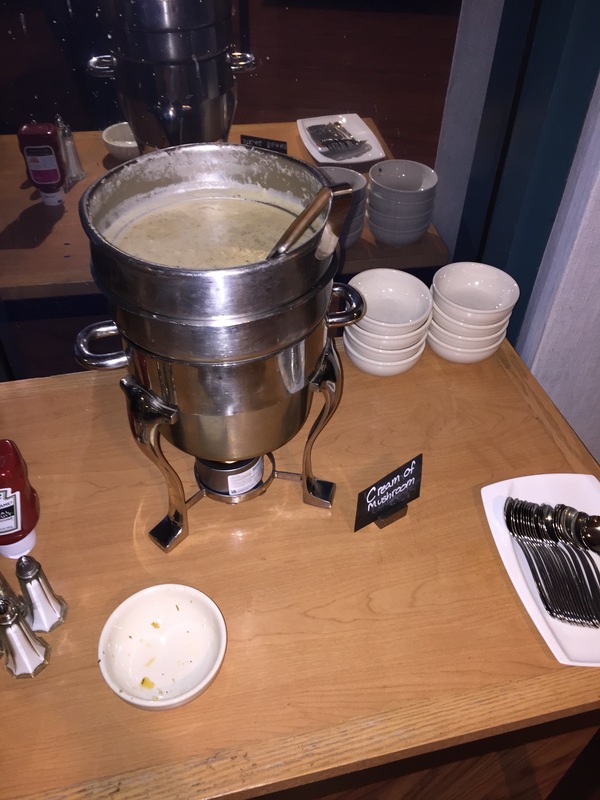 The buffet offerings were extensive at this Hyatt Regency. 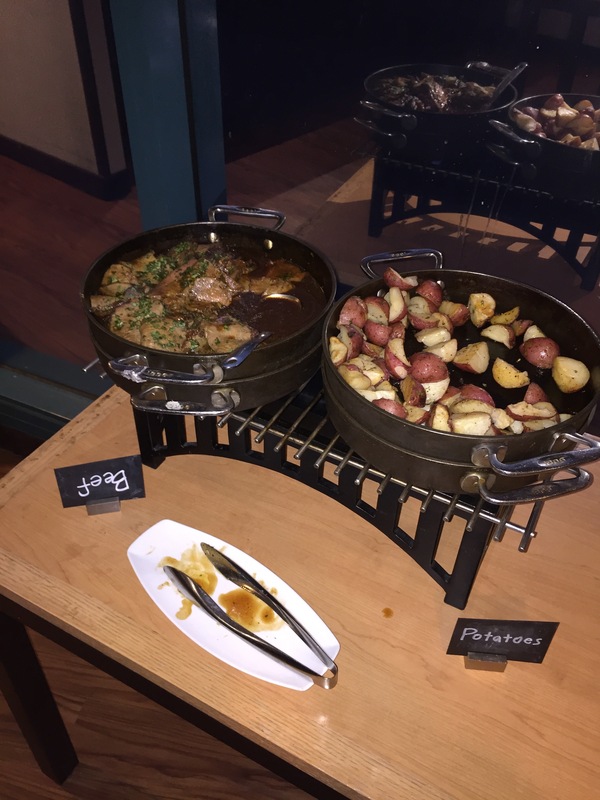 The buffet featured three hot items including a beef roast and potatoes as well as cream of mushroom soup. The chilled items included a large salad with multiple toppings and dressing options. 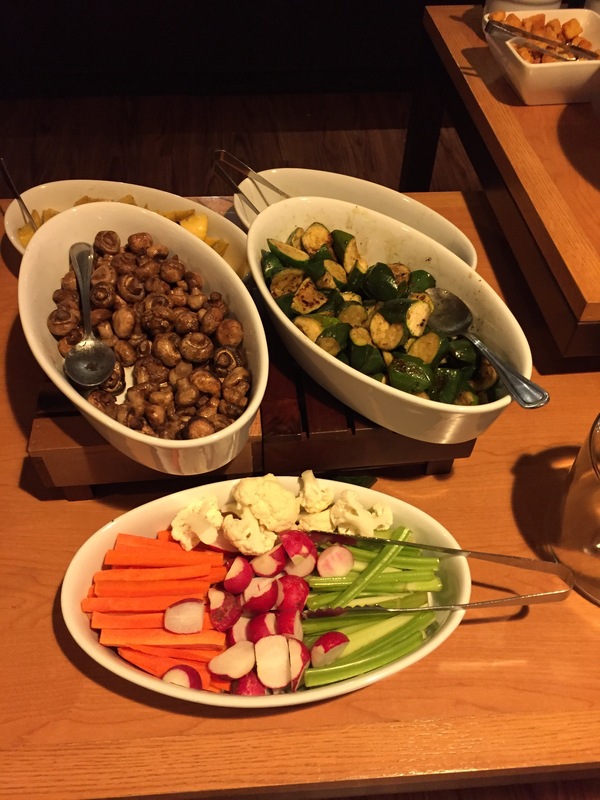 There were cut vegetables as well as grilled asparagus and mushrooms. Hummus and olives and a few other items were available as well as several varieties of cheese. 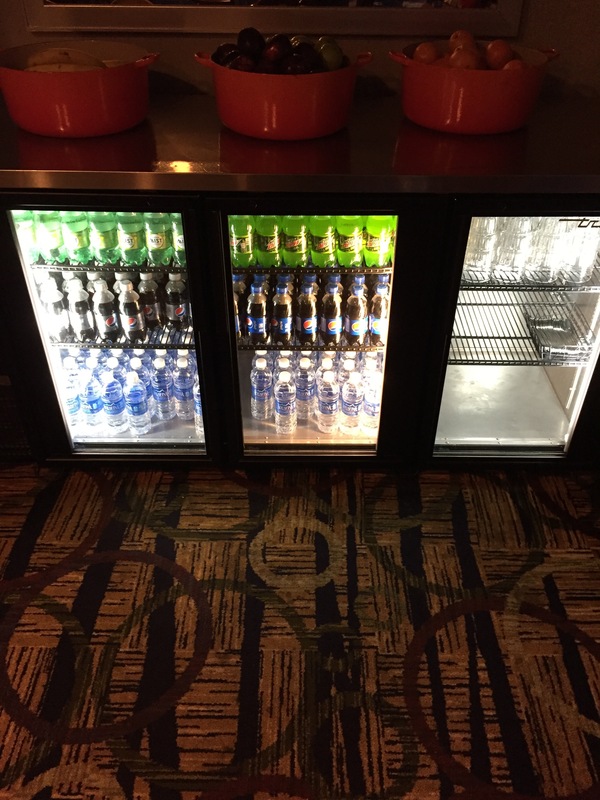 A refrigerator was available with sodas and bottled water. A coffee machine was available as well as three different types of water including sparkling, still and chilled still. 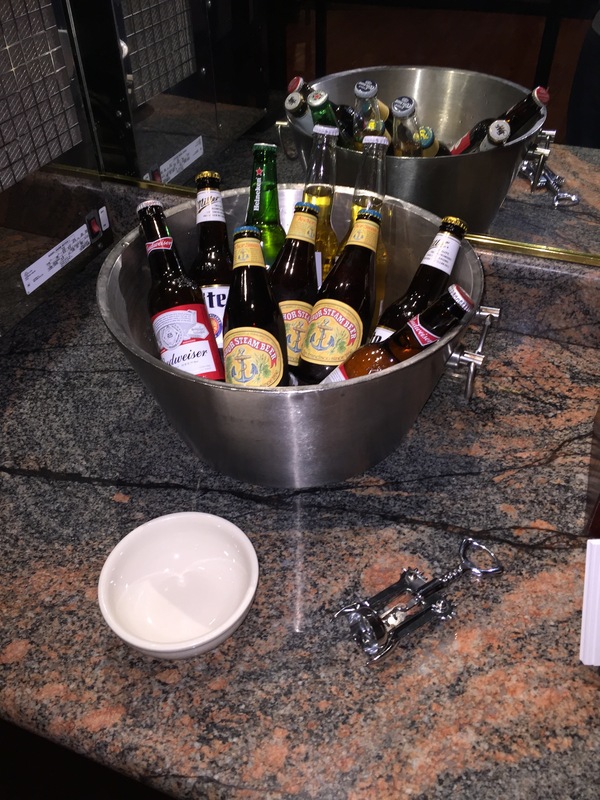 A limited honor bar was available with about five or six types of beer and three types of wine. A card was present for you to fill out listing what you consumed. 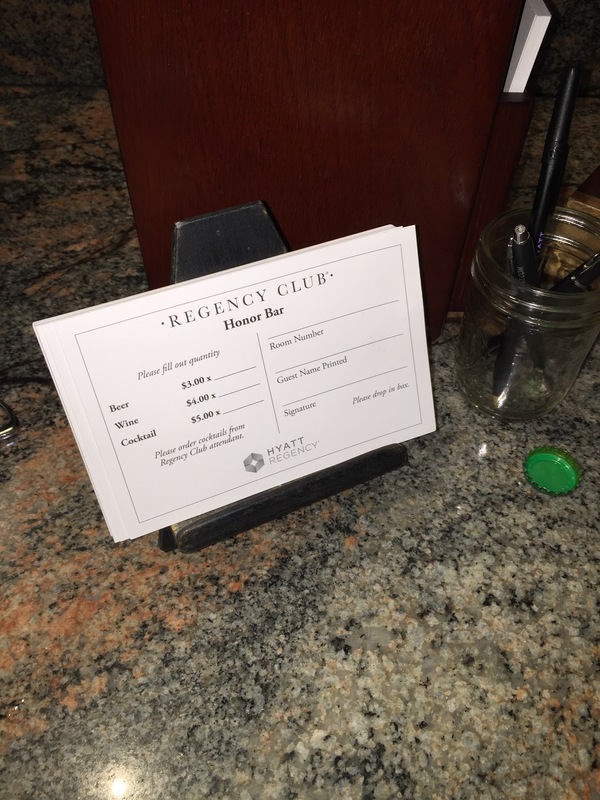 There was a sign that said mixed drinks could be ordered from the Regency Club attendant. While I was in the lounge area, a colleague entered the lounge to check on the food levels. The colleague did not interact with me while I was in the lounge. She was noted to have a conversation with another colleague or a friend who was not in a hotel uniform for the majority of my visit. 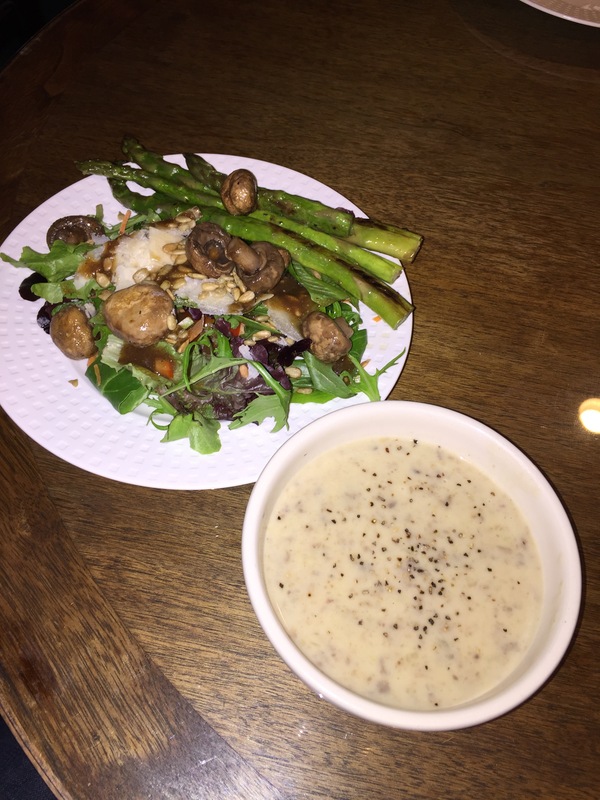 From the buffet I selected a salad with balsamic dressing, grilled asparagus and a bowl of cream of mushroom soup. The salad was served chilled. The salad consisted of a variety of lettuce, carrots and sliced cucumbers. I added cheese and balsamic dressing. The salad was excellent. The vegetables were fresh and the cheese also had a good flavor. The dressing was light and tangy. The cream of mushroom soup was hot. It had a thick consistency and a bold flavor. The lounge featured clean dishes, glasses and flatware. My departure from the lounge was not acknowledged. I had a 6:30 AM flight so I had to leave the hotel early. I approached the front desk to check out around 4:45 AM. The colleague greeted me and offered assistance. I requested to check out and she asked for my room number, After I provided it she thanked me for staying at the hotel and she inquired about the stay. The colleague reviewed the charges and offered to email the folio. The colleague thanked me for staying at the hotel and she invited me to return. I waited for the hotel shuttle at one of the posted times. The shuttle departed about 10 minutes late. 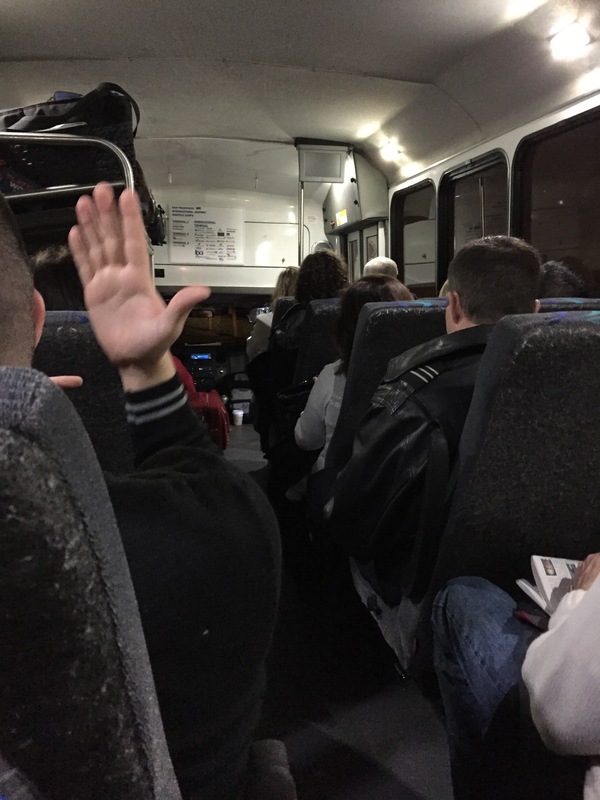 The shuttle was almost completely full. The shuttle departed promptly and there was about a 10 minutes’ drive to the airport. The driver was friendly and polite and he announced the terminals as we arrived. When I departed the shuttle the driver thanked me sincerely and he wished me a good day. Overall it was a nice experience at the hotel. 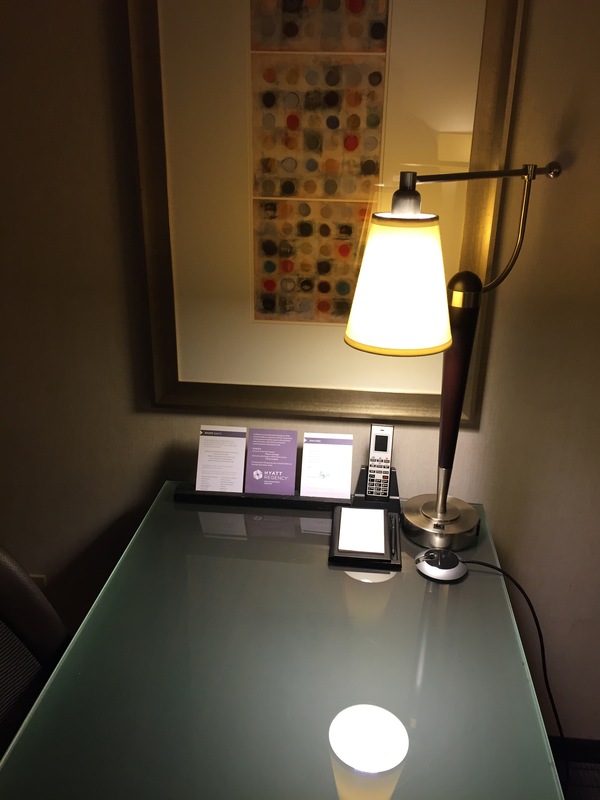 I was impressed by the friendliness of the front desk colleague who checked me in. 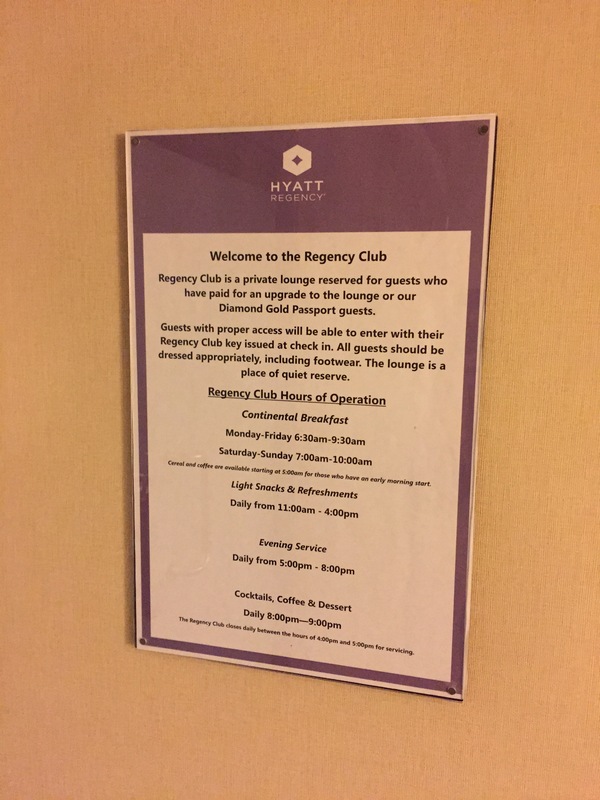 In addition, I felt that the food options in the Regency Club were excellent. 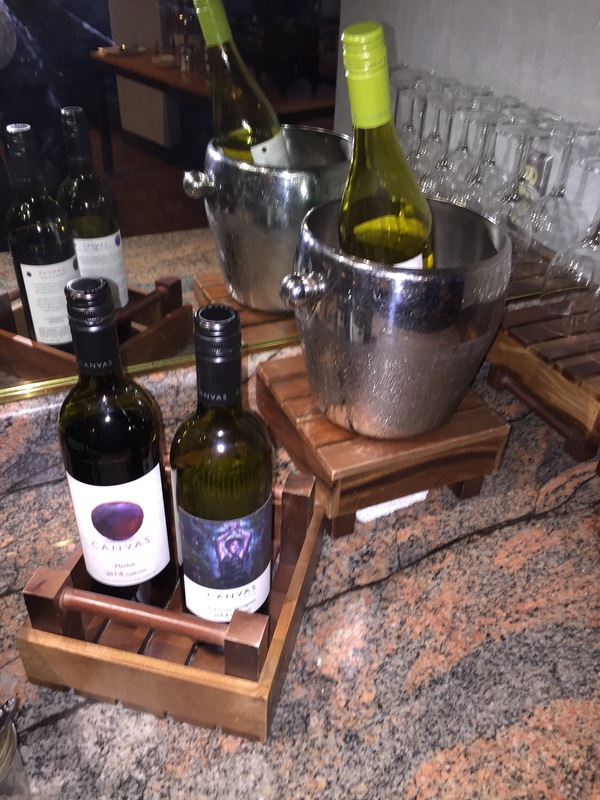 I am used to SPG where the food generally is minimal so it was a nice surprise. 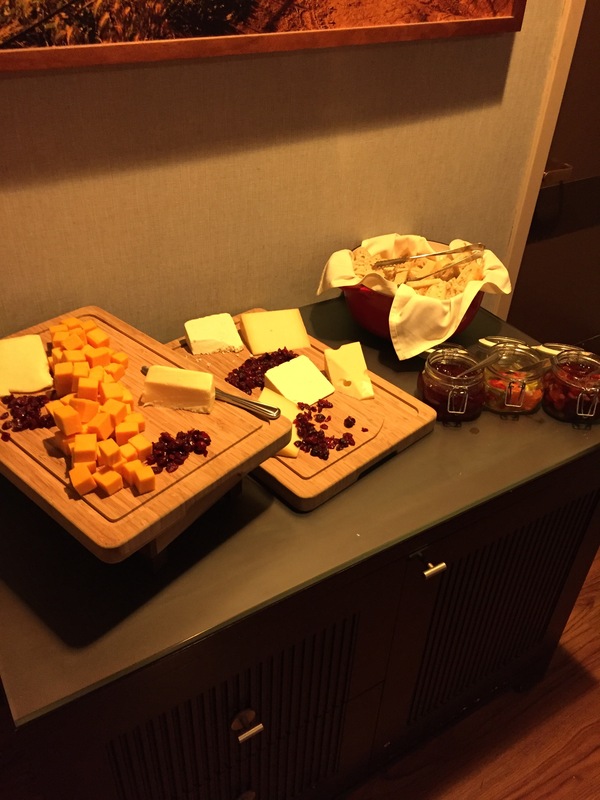 I look forward to future Hyatt stays this year.